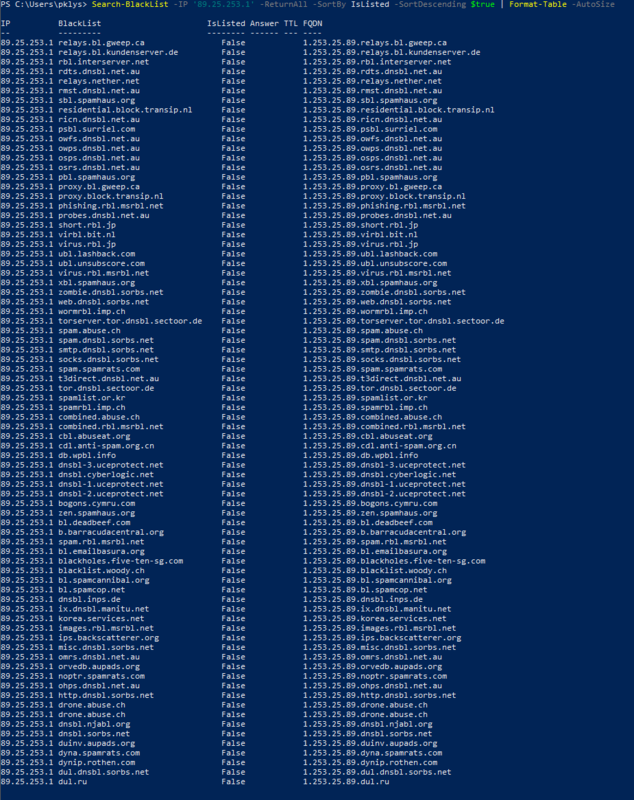 Following PowerShell Module provides basic functionality of Searching All (almost all?) 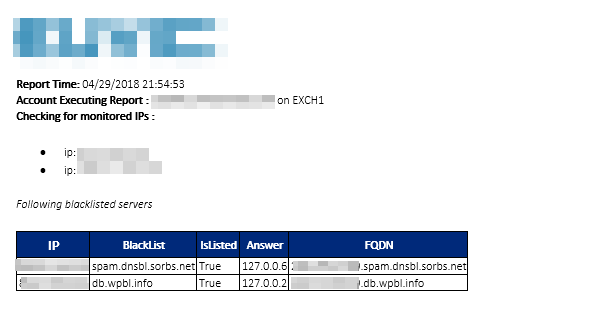 DNSBL (DNS BlackLists) and at the same time provides an easy way to setup daily reporting to keep you informed about your IPs status. The basic functionality of this module is the ability to quickly verify if given IP address is on any of over 80 defined DNSBL lists. Below code will return results only if IP is on any of the DNS records. Following code gives you the ability to sort your results depending on requirements. Below code shows a bit more advanced functionality where all results return (whether IP is on the blacklist or not). You can also pass multiple IP addresses at once. That's where the additional sorting option comes useful, so you can sort it as required. Proper values are IP, IsListed, Answer, Blacklist, FQDN. The results are as below. As you can see the sorting was by Ip, but you could easily sort it by BlackList, IsListed or any other column. 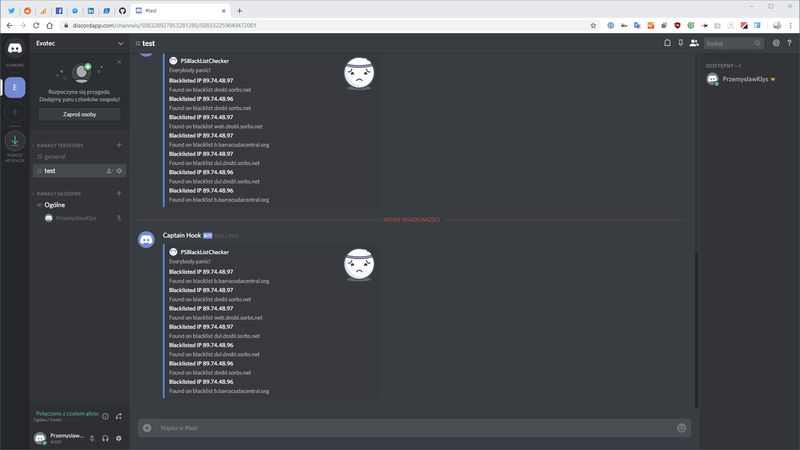 As mentioned earlier PSBlackListChecker has reporting functionality. You can set it up to send you reports on demand hourly, daily, weekly (this is instead Task Scheduler functionality than the module itself). It's just matter of setting up below code in Task Scheduler per your needs (up to every 5 minutes). Keep in mind that setting up running every X minutes would be overkill as the code does require some time to run (up to 30 seconds -2 minutes per IP) and DNS doesn't have that frequent updates anyways. As with most of the code by Evotec, the reporting has built-in company branding, font settings so you can have it adjusted to your needs. It does support relay servers, just like it supports any other SMTP based server. Keep in mind that EmailPriority in $EmailParameters will be overwritten based on the choice from $ReportOptions. 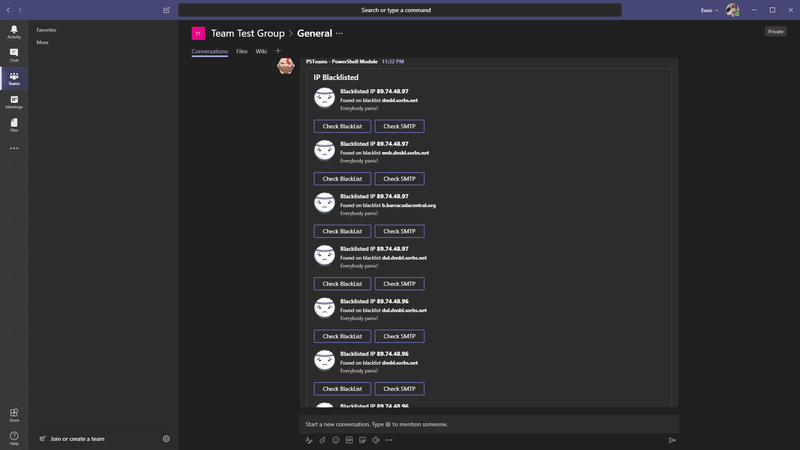 With the newest version, there are also notifications to Microsoft Teams, Slack and Discord. 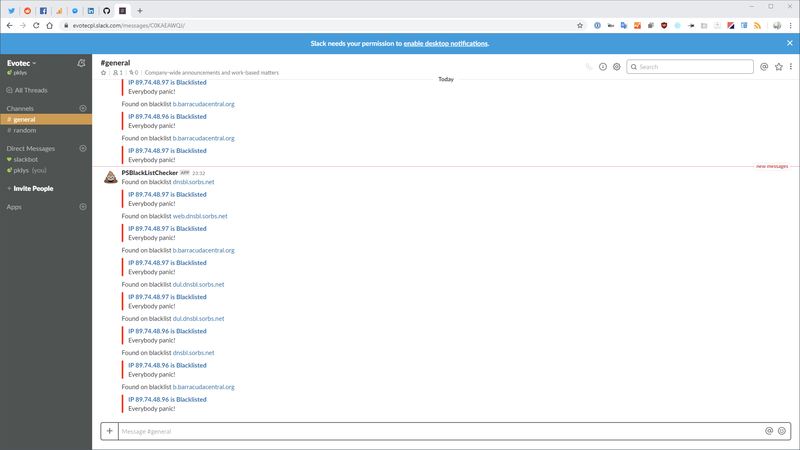 EmailSubject         = "[Reporting] Blacklist monitoring"
Depending on options that you choose in the configuration script your report may arrive only if your IP is found on the blacklist and with only blacklists that contain it. Finally all emails can be tagged with HighPriority when IPs are found on the blacklists. While you can use the script in a standard way by downloading it, putting it in the right places and getting it run either standalone or by running reporting in Task Scheduler, there is a much simpler way. 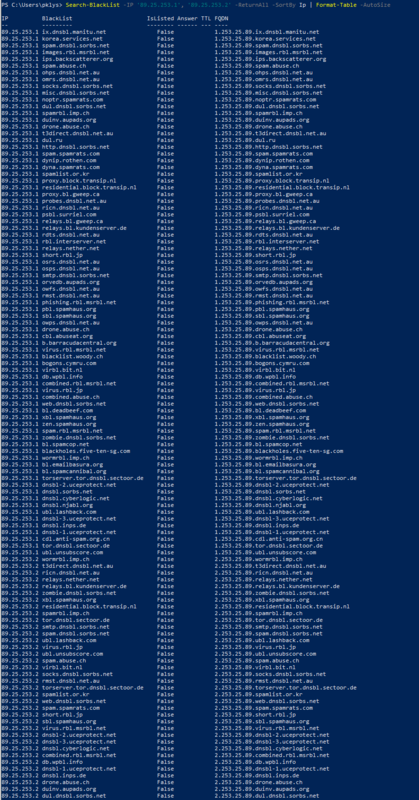 Since the script is available on PowerShell Gallery, you can install the module and run it from anywhere. Just use Install-Module PSBlackListChecker. Accept untrusted repository, and finally accept installation of module. And that's it… you're free to use Search-Blacklist or run the automated reports. No need to play with copying files (except for the configuration of reporting of course).